In war, as in love, many people have their special songs that bring memories flooding back. This magnificent digital recording recreates the atmosphere of those times. 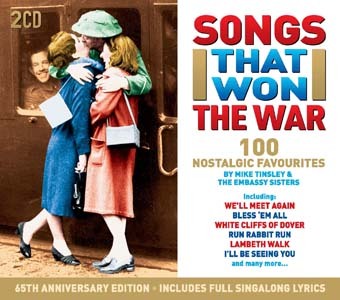 Former RAF Corporal Mike Tinsley and forces sweethearts The Embassy Sisters combine on 50 songs that gave hope and joy to millions on the long road to victory. 45. Who Do You Thing You Are Kidding, Mr Hitler? 50 of England’s most loved and familiar songs. For many, these songs will revive nostalgic memories of the Street Parties that commemorated the end of the Second World War. Austerity and ration books were set aside for a celebration of the best of British.